December 16th, 2014 is the deadly dark day of Pakistan as in early morning the most secure army-run school of Peshawar was attacked by Taliban militants. Total 141 people were dead. 132 students, 9 teachers were bruise killed by Taliban’s while 245 people were injured in Taliban attack. But unluckily 100 teachers and students were hostages by gun shots on Warsak Road. The suicide bombers were in military uniform jumped enter into the Army Public School and Degree College from backyard wall through graveyard, as no strict security checks are allotted behind. The Tehreek-e-Taliban Pakistan Head Mohammed Khurrassani accept the charge of Peshawar attack as they intended to kill the old students in Army School in revenge of Zarb-Azam by Pakistan Army in North Waziristan. “Our suicide bombers have entered the school; they have instructions not to harm the children, but to target the army personnel. It’s a revenge attack for the army offensive in North Waziristan. Six of our fighters successfully entered the army school. We were giving them instructions from outside. We will target every institution linked to the army unless they stop operations and the extra-judicial killing of our detainees. Our detainees are being killed and their bodies are thrown on roads. We had issued them instructions to our armed men not to harm small children even if they are the sons of either senior military or civilian leaders,” the TTP spokesman said. The Heavy shooting of bullets started inside the Army Public School, which are controlled by soldiers who surrounded the school at 11 A.M on Tuesday. The Army helicopters descend quickly over the school while ambulance took emergencies to the hospital. “After half an hour of the attack, the army came and sealed the school,” a teacher told a private television channel outside the besieged school. Various political parties condemn the Taliban attacks on innocent people in Army School. The Pakistan Prime Minister Nawaz Sharif decided to personally monitor the operation and he flew to Peshawar in his private jet from Islamabad. 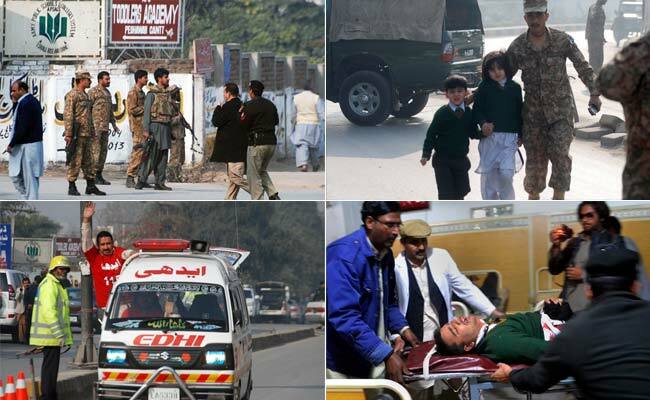 “I condemn the attack of Peshawar Army School.Most of those killed were between the ages of 12 and 16. According to the latest report by ISPR Gen.Bajwa all the six militants who were involved in the attack are now killed by the security forces. The Pakistani military had said that some teachers and students successfully vacate the school before shoot or trapped by enemies of humanity Taliban but unluckily many couldn’t manage to evacuate in time. Do it online if you can’t go outside into the markets!